The Adobe Elements line of consumer video editing and photo editing tools is into its second decade with the release of Premiere Elements 12 and Photoshop Elements 12. This annual update is not a major new overhaul or a wildly new interface. Instead, it continues Adobe's focus for Elements in two areas, organizing assets and refinement of the interface. It also continues Adobe's practice of adding fun new technology automation like the one-click Auto Smart Tone that learns your editing preferences for photos and videos. Both applications also feature cloud integration with the Adobe Revel mobile apps to save your media in online albums to view on mobile apps. The new Premiere Elements 12 video editor adds new Guided Edits for step-by-step operations, and the intelligent Auto Smart Tone adjustments. It also includes a variety of new assets, including 50 auto-fit soundtracks, 250 sound effects, and four new Hollywood film looks. You can start with quick storyboard-based video editing on a single track, and then move to Expert mode with a full timeline and large array of tools, ranging from Instant Movie generation from a variety of themes, to playback effects, to Time Stretch and Remapping, to dynamic Motion Tracking. For more advanced users, it also provides precise control over the application of effects through video adjustment layers that can be stacked on the timeline. Premiere Elements provides a broad array of powerful tools, but still within an uncluttered interface and with plenty of assistance to understand the options. See full article -- Adobe Premiere Elements 12 Review -- at Videomaker.com. Audio gear like headphones used to be defined by its sound qualities, the way the designers tuned the sound -- for example to be "more brassy" for strong percussion, or have a "strong bass" for heavy metal. But new digital designs like the Parrot Zik headphone are part of the next generation of programmable audio devices, where you can customize the sound to your personal preferences from your smartphone or tablet. The Zik is controlled from the free Parrot Audio Suite app for iPhone and Android, which enables DSP (Digital Signal Processor) algorithms in the headphones to tune the sound. You can adjust the balance of the sound 7-band equalizer. And the Parrot Concert Hall effect positions the sound within an ambient environment, so you can move the stereo images from the sides to the front, and adjust the virtual space from a small room to a concert hall. Plus, there's a bonus setting personally programmed by Lou Reed. But the Zik is a lot more than highly configurable, as you would expect from the $399 list price. It's wireless, supporting Bluetooth 2.1 and pairing with up to five devices. And it supports NFC (Near Field Communication) for pairing, as on Android devices. There's also a 3.5 mm analog input to play the old fashioned way with a cable, and passively with a dead battery. It also support voice calls, with clearer sound from two directional mics, plus a bone conductor sensor that captures the vibration of your jawbone and merges it with the sound of your voice. And it performs active noise cancellation, with 4 active microphones inside and outside each earpiece to eliminate up to 98% of ambient noise. There's also a head detection sensor that can pause or restart the music when you take off or put on the headphones, and switch an incoming call to your smartphone if you remove the headphones. But the coolest technology is the most subtle -- a touch-sensitive control built into the right earpiece. The earpiece surface is flat and smooth, but you can tap on the panel to play or pause, swipe vertically to raise or lower the volume, and swipe horizontally to skip tracks forward or back. The Zik has a distinctive over-ear design, featuring an adjustable metal headband with "leather-like" soft wrapping, and the metal look extending as accents onto the back or white matte earpieces. All this impressive technology is crammed into somewhat large earpieces that are around 2 3/4 x 3 1/2 x 1 1/2 inches thick. It also uses a custom rechargeable battery which provides about 6 hours of usage with all features enabled, 18 hours with only active noise cancellation, and 24 hours standby time. The bottom line on the Zik is that it is not just a collection of cool technology. The features work well together -- the Audio Suite app is simple and straightforward (and fun) to use to configure the sound, and the touch-sensitive control is really pleasant to use. Even people who did not typically use headphones found swiping on the earpiece to be a very natural way to adjust volume and skip through tracks. The Parrot Zik headphones are available in classic black with silver metal, black with gold, white with yellow gold, and white with rose gold. You may know Verbatim for its legacy in recorded media technology including CD and DVD, but there's so much more -- from other storage devices, including hard disks, USB drives, SSD, and memory cards, to an array of accessories including mice and keyboards. Verbatim's style is straightforward, with clean and colorful designs without excess sizzle. For example, the Verbatim Store 'n' Go SuperSpeed USB 3.0 Portable Hard Drive is exactly what the product name describes -- a compact portable hard drive that supports up to 10X faster data transfers with USB 3.0. The drive is pocketable and light (4.72 x 3.11 x 0.71), with a curved front surface that flows into a flat back with non-skid bumpers. It's available with 500 GB capacity in black, blue, and pink for around $70 street price, and with 1 TB in black for around $90, and comes with a seven-year limited warranty. Verbatim adds software to format the drive to FAT32 or NTFS (Windows) or FAT32 to HFS+ (Mac), and also includes Nero BackItUp & Burn software for Windows. And did I mention we're now talking about a full terabyte of storage in a size that's a bit thicker than a pack of Post-It Notes, for under $100. There's no excuses for losing files now! See my Holiday Gadgets and Wireless Accessories 2013 coverage for more on portable devices. 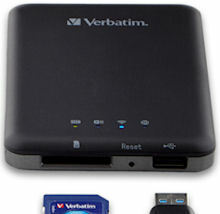 In addition to physical storage drives that you can connect to your devices, Verbatim also offers wireless access to your files through the Verbatim MediaShare Wireless Portable Streaming Device. Like the Maxell AirStash Wireless Flash Drive (see earlier post) and Kingston MobileLite Wireless (see earlier post) the MediaShare is a wireless bridge to physical storage. You can access USB disk drives and SD memory cards over Wi-Fi -- so you can extend beyond the built-in storage of smartphones and tablets, and easily share collections of files among all these portable devices. Once connected, you access the contents of the connected storage devices using the MediaShare app for iOS or Android devices. With the app, you can browse the files, and view photos, music, and videos. You can delete files, and copy them in either direction between your smartphone/tablet and the drives connected to the Mediashare. MediaShare -- it supports a second Wi-Fi connection to your local hotspot, so you can stream and copy files and still access the Web. The MediaShare also has a microUSB port, so you can connect it to a computer to use like any other external USB drive. And it's battery powered, charged through the same microUSB port, to run up to 9 hours. The Verbatim MediaShare is a bit larger than some similar devices at around 4 1/3 x 3 x 1/2 inch, but it supports access to USB drives as well as SD cards. It also has nice features like separate status lights for power, data read/write, Wi-Fi, and Internet. It's available for around $56. Bluetooth keyboards allow you to be more productive with your tablet (or smartphone), especially when you have a lot of typing to do, composing longer-form email or editing documents. I've covered combo keyboard / covers for iPad tablets (see previous posts on Belkin and Logitech). These are sized to protect the tablet display when closed, and also serve as stand. But if you want even more portability, check out the even more minimized Verbatim Ultra-Slim Bluetooth Wireless Mobile Keyboard. This skirts the lower bounds of mini, at 8.7 x 4.7 x 0.2 inches and 7.7 ounces. The low-profile keys are a tad cramped, but are as large as possible with no wasted space between, and do have travel when pressed. The layout also includes cursor control keys, plus a full row of smart function keys, including brightness, cut/copy/paste, undo, playback controls, mute, and volume. It uses a microUSB connector for charging the internal battery. The Verbatim Ultra-Slim Bluetooth Wireless Mobile Keyboard gives you more efficient typing with your tablet in an impressively minimized package. It's available in black or white for around $49, including a carrying case. Look out -- The combination of the power of our smartphones and tablets as portable devices plus wireless connectivity through Bluetooth and Wi-Fi and cellular opens wonderful opportunities for interesting and fun interactions. You can download an app, and turn your smartphone into a remote control for the TV or music in your home, or interact with portable devices like health monitors or wireless trackers. Or you can have fun with the new version of remote-controlled cars -- the Orbotix Sphero Robotic Ball that you control wirelessly over Bluetooth to drive around and change colors. Unlike a race car with small tires, the ball can change directions quickly and roll over uneven terrain (including rugs). So it's fun to race and drive fast in open spaces, challenging to steer though obstacle courses in your home, and great entertainment for babies and pets. And the Sphero is more than a ball -- It's a gaming system, with over 25 apps for iOS and Android, so you can drive and race, play tabletop and multiplayer games, program its movement, and even use it as a controller. The Sphero is 4.2 inches in diameter, made from a rugged high-impact polycarbonate shell. And it's waterproof up 15 feet, and even floats. It glows with thousands of colors, and is motorized with an internal guidance system with gyro and accelerometer to control its speed and direction of movement. The Sphero Original travels at speeds over 3 feet per second, and now is available for around $80. The new Sphero 2.0 for $130 is twice as fast at up to 7 feet per second, and three times brighter with multicolor LEDs for more colors. It also comes with two pop-out ramps for more action, and can be upgraded with a Nubby cover ($15) for better traction over rougher terrain (and in water), and to protect against scratches, scuffs, and the elements. But how do you drive a ball? What direction is forward for a circle anyway? It's simple -- you orient the Sphero by rotating it in place to position a blue "taillight." Then you drive it around relative to that initial aiming direction, although you may need to re-orient after a while of racing around. To store and recharge, just drop the Sphero in its charging cradle. It uses wireless induction so there's no connector to plug in. When you pick it up, give it a double-shake to enable Bluetooth pairing. It then can run for an hour on a charge. The Sphero works great indoors, even in small rooms crowded with people and holiday debris, though I typically reduce the maximum speed for better control in confined spaces. In larger rooms or outdoors you then can open it up for speed racing. 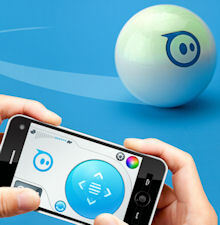 The Sphero is especially fun for playing with pets -- being chased by a dog, or chasing after a cat. And it's really entertaining with small children, as babies track the colors and toddlers crawl after it. Entries posted to Manifest Tech Blog in December 2013, listed from oldest to newest.